If you follow me on Facebook, I reckon you’ve noticed the lovely Ember-Raine Winters and myself doing a sh*tload of stuff together. We’re like two peas in a pod, two crayons in a box, two chips in a bag, two Reese’s Peanut Butter Cups in one glorious package of awesomeness, two, yeah, you get the picture, eh? Anyhoo, our most recent creepily synchronized accomplishment was reaching 500 likes on our Facebook author pages! Sooo, to say THANK YOUUU for the support and celebrate our togetherness, we’ve decided to run a giveaway, umm, together!! We both have super cool readers’ groups too! Okay, fine. Not really cool cuz we’re both complete dorks but cute dorks, right? Riiight?? 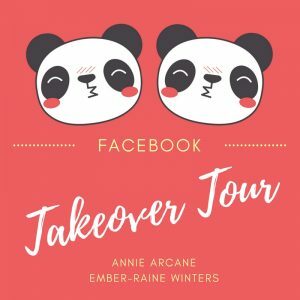 To celebrate our June 10th pre-orders, Beautiful Deception and Hart of Mine, the lovely Ember-Raine Winters and I are going on a mini takeover tour together. Come join us for games, giveaways and all sorts of goodness! Well, more like pure awesomeness but I was stuck on the G’s hahaha…haha…ha…yeahhh. IMPORTANT NOTE: The majority of reader groups on Facebook are “closed”, so you’ll wanna join early to give admin enough time to approve your membership.